Finally I’m going to blog about my Birthday! Which was 10 days ago! 5 June 2012! I almost forgotten I wanna write a blog post about it to thank my friends & colleagues for celebrating with me! Last year, I held a birthday celebration at McDonalds! Here’s the link of my blog post of my Mac Birthday: My 2+5=7th Macdonald Birthday Party! So this year, I not going to hold any birthday party~ I just want to have some mini & simple celebrations with my friends and family… Simple & Good! Had my first celebration with my 2 BFFs, Natalie & Kaiwen..
We had a staycation at Quincy Hotel from 3 June to 4 June 2012! 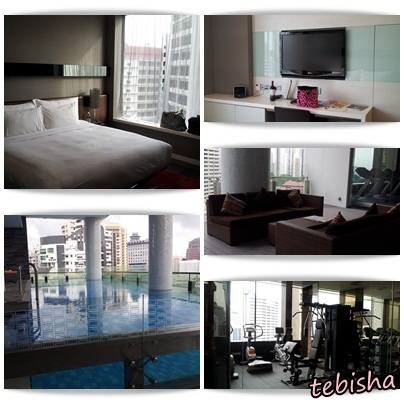 Its a Boutique Hotel located at Mount Elizabeth, very accessible to Orchard Road..
As we got 3 persons, we just need to add another $60++ to enjoy an additional buffet breakfast, set lunch & dinner. Room is clean, bed is comfy~ Pool is not crowded, Gym is well-equipped..
Service wise I would give 3 out of 5 stars, staff are quite friendly but response time a bit slow.. Need some improvement..
Had a great 2 Days 1 Night chill out staycation with my BFFs~ Relaxed and Enjoyed with both of your company! 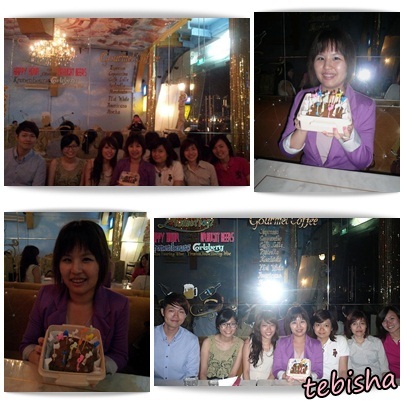 Thanks my 2 BFFs for celebrating with me.. Love ya ♥♥ Looking forward to our trip to Korea in Oct! Can’t wait! Took a day off on 4 June (Mon) due to the staycation. And back to work on 5 June (My actual birth date).. 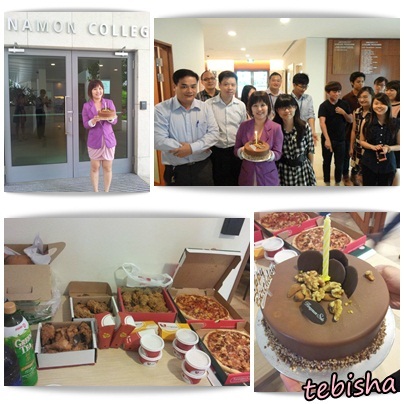 I don’t have enough leave to take another day off T.T, I need to save all my leaves for my overseas trip in coming Oct..
I’m so fortunate to have such an awesome supervisor and great colleagues to celebrate my birthday for me..
My supervisor forked out the most money for the cake and food for my mini birthday celebration during lunch time. Not forgetting my colleagues too, Thank you all very much for the celebration & food! On that night, my besties arranged a birthday dinner for me.. I suggested to them that I wanna try out this restaurant “Queens” located at Sentosa Boardwalk..
Have you been to Sentosa Boardwalk? Its a new link way from Vivo City to Sentosa! At night the scenery is quite romantic! It’s a great place for you guys to go there “Pa-tor”! Queens has various set meals which are very valuable! Worth to go there and try it! Ohh, my dear friends wanted to surprise me with Cindy’s home-baked Green Tea Cake when I went to toilet.. In the end, the candles burned too fast, when I back to the table, half of the candles were melted.. Thanks Cindy for the cake! Its really yummy! Thanks my BFF CC for arranging the dinner! Thanks Joanna, Claudia, Wan Yan & Jia Jun making your way down to have the dinner celebration with me! Domino’s Exclusive Offer!! 50% off Pizzas!